They say time flies when you’re having fun. I celebrate my 1 year anniversary at the helm here at Energy Gym & Crossfit Skirmish. In a career you don’t enjoy, 12 months can drag like 12 years. In a job you love, the days in a year pass like 365 minutes. There are so many highlights that I could write a book, but for the purposes of this blog I will summarise them into the following categories: customer, colleague, company, controls, and community. Interacting with my customers is my favourite part of the job. Without you all, we would not have a thriving business. I am impressed each day by the hard work and dedication, determination, imagination, and friendliness. All of these ingredients help engender our wonderful positive atmosphere. Whether you run, body-build, lift, or practice Crossfit, my observations are that everyone is made to feel welcome, and encouraged in their own journey. When I started in my role, my quest was to make the gym a warm and friendly place to be. The importance of a warm welcome, with a smile, is one of the most important components to providing excellent customer service. I make a big effort to learn the names of my customers, and if I don’t quite have them all memorised yet, I am close! Decades of playing chess has helped build my memory. My team have worked hard, and helped me deliver on my promise to improve the service standards and make the gym community feel like a family. I look forward to work every day, because of all of you wonderful customers. It is an enormous pleasure to captain the ship, in our sea of fitness. Thank you all for choosing to train at Energy Gym, and for contributing to the success of 2015 and so far in 2016. Thank you to Gavin and Siobhan for giving me the opportunity to lead the team, and manage the day-to-day running of the business in my own style. Having autonomy over recruitment has allowed me to mould my own front-of-house team, and personal trainer (PT) team. The front-of-house team are the people who open our gym at 6.30am, and work through until 10pm most evenings. They support and serve the customers with encouragement, provide technical support with exercises, play the music, fuel the exercise work with protein shakes and protein flapjacks, and (perhaps most importantly) create a brilliant atmosphere in which everyone can enjoy their exercise. I am proud of the team. Well done to James, Poppy, Natalia, Joe and our new recruit Tom Philip. Their enthusiasm for the job, and support to my methods of service delivery, and their impressive variation of fitness skills, make the team strong, and with great balance. The mix of youth and experience, energy and discipline, contribute to the success of our business. The PT team are an impressive unit. With combined experience of over 100 years in the industry, we boast a formidable team. I am continuously inspired by watching my team demonstrate new ways to challenge their clients. My 2015/2016 PT team are professional, technically excellent, and extremely hard working. Sasha and his team of Crossfit coaches have built a fantastic mini-community over the last 14 months. Our new state-of-the-art box/Olympic lifting studio has been a massive success. I challenge anyone to name a better facility in Edinburgh. The coaches start at 6.30am and finish up at 9pm some evenings. Sasha, Craig, Leffie, Tobi and new for 2016, Daniel, have done and continue to deliver excellent work. Well done guys. Let me also give a special mention to Liz, our cleaner, who looks after our building. Gyms are inherently messy places, with hygiene being very important. Liz comes into work whilst most of us are still in REM sleep. Huge thanks to Liz for all her hard work. To the naked eye you are used to seeing me in my under-armour gear, and bandana. Your ears are used to listening to me playing 80s and 90s music from behind my desk at the gym. However there is a business man underneath the fancy dress outfit. The outward persona you see is underpinned by a serious side to me, with a tremendous desire to grow our business. My career background was built in the business world with Edinburgh monolith Standard Life, and banking giant Barclays. I won’t bombard you with my managerial jargon, but wish to share that our gym/business is in a state of growth. We invested £40k in our new studio, and gym. Our Energy Gym & Crossfit Skirmish membership has grown massively as well as our in-house offering with both protein based snacks in the gym and the fantastic BattleBox shop offering anything you need for working out from nutritional supplements to wraps and clothing. The leadership team: Gavin, Siobhan and I, meet regularly to set out goals and actions both short and long term, always seeking to improve what we offer. We are committed to continuous improvement, and taking care of our customers, and our colleagues. 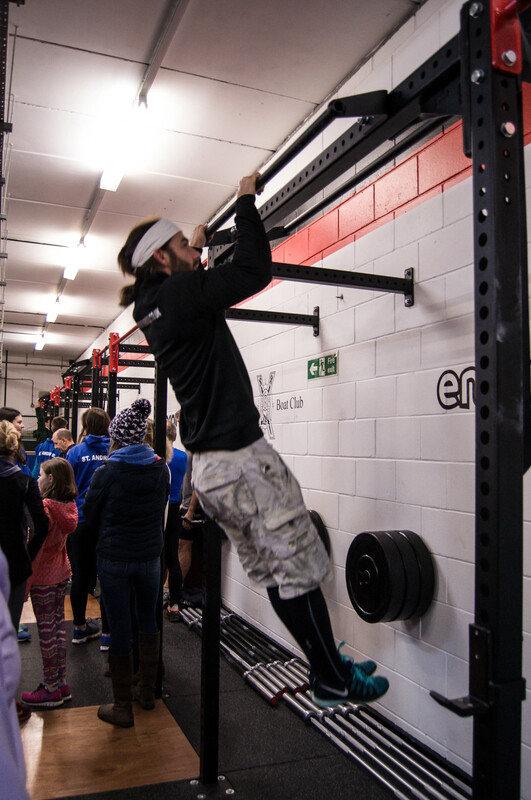 From a stewardship angle, I am proud that Energy Gym & Crossfit Skirmish is bigger and stronger than ever before. Not the sexiest part of the job but it is equally as important as the above. Without procedures, we would be in chaos. James Ward helps me manage the maintenance checks of our equipment, and does a bi-weekly check of all of our kit. In my tenure we have had very few accidents, and zero major accidents. Gyms are inherently dangerous places for accidents. My team are vigilant, and pro-active in spotting potential risk I am pleased with our record so far. There is however always room for improvement. Last but not least is our community. Energy Gym & Crossfit Skirmish is my second family, and I am proud to be a part of it. Many of my customers are now friends. I care about my team, and want to develop them in their careers, and personal goals. I enjoy delivering inductions to our new gym members, where my goal is to make new members feel welcome and supported. I enjoy working with my PT clients, who are working hard to achieve their respective goals. I know they dearly love the new air-bikes for interval training towards the end of their 1 hour PT sessions (or maybe not so much!). I led a small team from the gym on a hike in the Pentlands hills a few weeks ago, conquering the summits of Allermuir and Castle Law. The team included effervescent English Literature teacher Alice Tozzi, who kindly checked over this blog for spelling and grammar. Hopefully I scored a better mark than my ‘B’ in higher English! Climbing hills and mountains has enriched my life, and it is my duty to give back to the community and share this passion with others. I take my responsibility as an ambassador for our gym seriously. The gym is collaborating with local schools: George Watsons, Merchiston, and Boroughmuir. Our culture allows young adults to develop their fitness, in a safe and encouraging environment. The team and I put a lot of emphasis in this in our collective goal to give back to the community. My closing thought takes me back to Good Friday, and a wonderful Easter service. After enjoying singing ‘Lord of the Dance’ with hundreds of other people, I spent a few hours hiking in the Pentland hills on my own, reflecting on my first year at Energy Gym & Crossfit Skirmish. I am blessed to have this job and this role in our community. I am happy. I am dedicated to my work. I am full of motivation and energy for the next chapter!